Alice Seno seems like a normal girl in high school. She's a bit shy; she's got a crush on a boy named Kyo, and she's got an older sister who is more popular than she is. 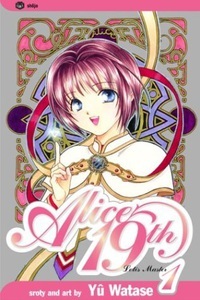 Pretty normal stuff until Alice has an encounter with a mysterious and magical rabbit girl that changes the course of her life. Words have power, and Alice has the potential to become a master of this power. Uncontrolled use of these words, however, can have deadly consequences, and Alice inadvertently sends her sister into a world of darkness. Alice resolves to save her sister from the darkness, but in order to do so, she must become a master of the Lotis Words. Will the dark side be more than she can handle?